You enter a default gateway and the gateway disappears, not even after a reboot – it just disappears in a couple of minutes. 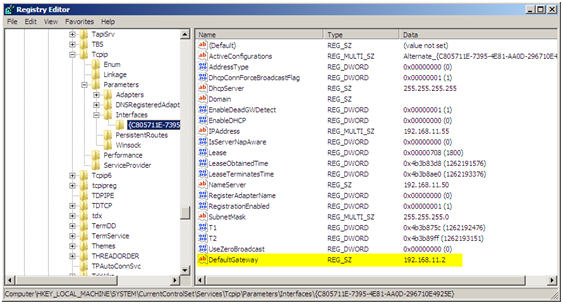 I’ve recently ran into this issue on a couple of Windows Server 2008 guest machines in a VMWare environment. I am not sure if it is isolated to VMWare. I could not find a resolution so I came up with this workaround. Navigate to the following key “HKEY_LOCAL_MACHINE\SYSTEM\CurrentControlSet\Services\Tcpip\Parameters\Interfaces”, select the interface that is missing the default gateway. You can tell which interface by the IPAddress entry. Create a new STRING value in the selected interface key. 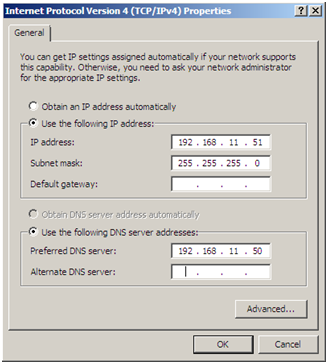 Open the properties of the network connection and you should not see the gateway listed, after I did this I did not have any more issues with the gateway disappearing. This entry was posted on Wednesday, January 20th, 2010 at 7:18 am and is filed under General, Windows 2008. You can follow any responses to this entry through the RSS 2.0 feed. You can leave a response, or trackback from your own site. Did I save you time and headaches? Buy me a cup of coffee. The more coffee I drink the more articles I can write. Facing the same issue in WINDOWS server 2008r2 physical machine, even after adding the same in registry issue is there, interface is not coming up. This happens because the VMware vCenter Customization Specifications Manager used to sysprep Windows 2008 guests uses the "Netsh int ipv4 set address" command to set the Default Gateway IP address. This command incorrectly adds a Unicode null character before the value of the actual IP address of the Default Gateway. I'm afraid that does not apply here. I set the gateway through the GUI and not through NETSH. I would try that hotfix but its not really a reproducible error, it happens every now and then.